As we age, so do the cells that make up our bodies. To keep us spry as we get older, our bodies rely on adult stem cells to replace the cells in our tissues and organs. Adult stem cells can only generate cell types specific to the organ or tissue that they live in. For instance, heart stem cells can only help regenerate or repair the heart, same for brain stem cells and the brain, etc. While adult stem cells have built-in mechanisms to help them avoid the aging process for as long as possible, they can only delay the inevitable for so long. So as the function of our bodies decline, so does adult stem cell function and with it our ability to regenerate damaged tissue. A group from Zurich, Switzerland studied how brain stem cells stay young as the brain ages. In a study published in Science on Friday, they found that young brain stem cells divide in a way that routes damaged proteins and aging-related factors away from the daughter stem cells and into their non-stem cell progeny, thus keeping brain stem cells healthy and youthful. 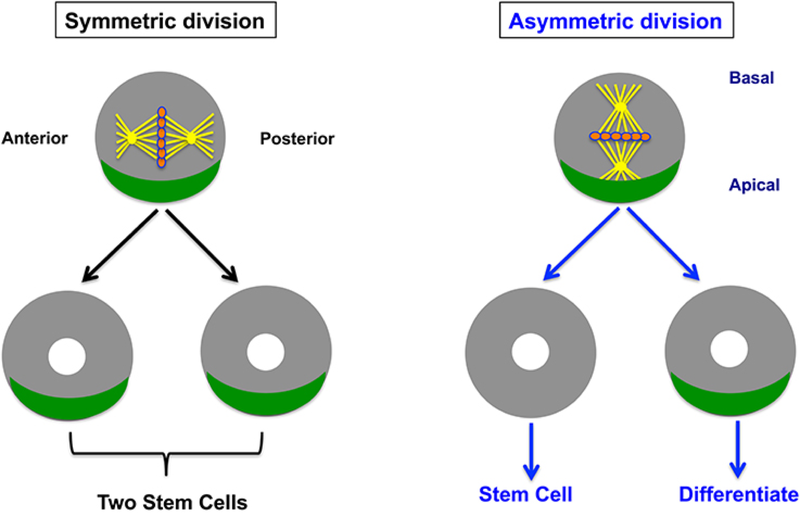 Brain stem cells divide asymmetrically into a daughter stem cell and a non-stem daughter cell that can differentiate into other brain cells (Image adapted from Berika et al., 2014). The Zurich group took a closer look at brain stem cells in adult mouse brains and found that they divide asymmetrically. This means that instead of equally dividing its cellular components between two daughter cells, the mother cell instead herds all of the damaged proteins and aging factors into the non-stem daughter cell, leaving the new stem cell unexposed to cell damage. In this way, the new stem cell is protected and is able to maintain its regenerative capacity. Brain stem cells are able to preferentially shuttle damaged proteins into their non-stem cell progeny by a diffusion barrier called the endoplasmic reticulum (ER). The ER is a membrane structure in cells that has a number of important functions including deciding what factors or proteins end up in which cells. The authors observed that during the division of brain stem cells, the ER forms a barrier between the non-stem and stem cell progeny that keeps the damaged proteins and aging factors in the non-stem daughter cell. This ER barrier remains intact during the division of young brain stem cells, however, they weren’t sure this was the case with older brain stem cells. The scientists watched older brain stem cells to see if this anti-aging barrier was able to hold up with advancing age. They observed that this barrier actually weakens with age and allows aging factors to go with the stem cell progeny. This happens because an important cell structure called the nuclear lamina, which regulates cell division, doesn’t function properly in the old stem cells. When they disrupted the lamina structure in young brain stem cells, as expected, the anti-aging barrier couldn’t properly block the transfer of aging-factors into the new daughter stem cells. Thus it seems that brain stem cells maintain their youth by generating diffusible barriers that block the transfer of damaged proteins and aging factors into their stem cell progeny during cell division. The strength of this barrier weakens with age, and when this happens, aging factors are more evenly divided between the non-stem and stem cell progeny, potentially causing stem cell damage and reducing their regenerative function. The authors note at the end of their report that further studies should be done to determine whether this anti-aging mechanism is unique to brain stem cells or if it occurs in other adult stem cells or cancer cells which display stem cell like properties. If similar anti-aging barriers exist, then targeting the age-related breakdown of this barrier could be a potential strategy to keep adult stem cells forever young and humans feeling and acting younger for a little longer.